Triple Leatherette T-Bar Display from NileCorp on SALE! More than 50% Discount. NileCorp has always been known for offering a wide array of jewelry displays for retailers and jewelry stores alike. From jewelry boxes, showcase trays, to set displays and necklace displays, NileCorp can provide the ideal jewelry display you’re looking for. But aside from its massive selection of jewelry display products, NileCorp also loves giving our customers sales and discounts every now and then, like our Triple Leatherette T-bar Display which can now be bought for the amazingly low price of $8.99. Compare to its original price of $18.75, by purchasing our Triple Leatherette T-bar Display, you will automatically save a total of $9.76. The Triple Leatherette T-Bar is a beautiful and contemporary jewelry display, great on countertops and ideal to be used on showcase events. Its three tiers let you display bracelets, necklaces, bangles, and chains. This item is made of black leatherette, and is 12” inches in length and 12 ¾” inches height, making it easier for you to place them along with other jewelry displays on a single countertop. All three tiers are of the same length and offset in height that offers three levels of display. It is available in black leatherette, which is perfect especially for gold and silver jewelry collection due to the contrast of its colors. 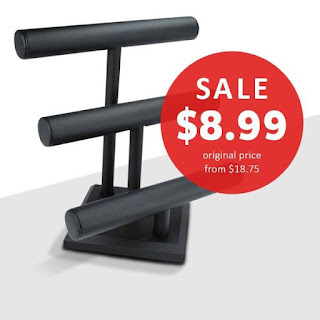 buy this item for less than $9.76. Aside from T-bar necklace displays, NileCorp.com also offers a variety of necklace displays from laydown displays, stands, frosty figurine, slatwall and polystyrene necklace displays. All these products are durable and designed to perfectly display and keep your new jewelry collection organized.